This book is now available from W.W. Norton. A 20% discount will be given to those who order using this link. 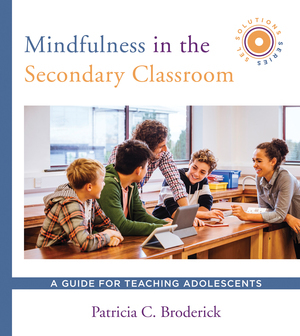 The book is structured to present, chapter by chapter, important aspects related to mindfulness and discuss their relevance to secondary school classrooms. Since mindfulness is for students and teachers alike, many of the examples used throughout refer to both youth and adults. Chapter 2 summarizes how our stress system operates and how we react to stressors in our lives. It makes a case for why we would want to practice mindfulness ourselves and teach it to adolescents. Chapters 3 through 7 describe features of mindful attention and offer ways to introduce, utilize and practice these competencies. Each chapter includes two vignettes that illustrate how the main themes of the chapter apply to actual teachers and classrooms. The final sections of each chapter contain reflection questions, one or two formal practices related to chapter content, and a set of main points to take away. Chapters 2 through 6 also include boxes entitled “Moving from Theory to Practice” that present practical tips about choosing programs, teacher training, ethical obligations and whole-school implementation. These sections offer key points that teachers might wish to consider as they evaluate the possibility of introducing mindfulness to their students and their schools in a systematic way. Finally, a way to increase the positive emotion of gratitude is offered as the concluding practice at the end of the book. Katherine Crum, kbc29@kbc29.com or 518-789-9635 for questions and enrollment. is a research-based mindfulness curriculum created for classroom or group settings. Mindfulness is the practice of becoming aware of one’s present-moment experience with compassion and openness as a basis for wise action. L2B is designed to coordinate with curriculum standards for health, developmental guidance or other academic areas in secondary schools. L2B versions exist for younger and older adolescents, as well as for college-age/emerging adults. L2B is being used widely both nationally and internationally and has been published in English (2013, New Harbinger) and Chinese (2016, Acorn Publishers). L2B was researched through a federal grant from the U.S. Department of Education (Institute of Education Sciences) and has been studied extensively in educational and clinical settings. Currently, ten published, peer-reviewed studies have demonstrated its effectiveness, and several more studies are currently underway. L2B has been recognized as one of only four mindfulness programs in the 2015 CASEL (Collaborative for Academic, Social, and Emotional Learning) Secondary Guide that meet research criteria for effective SEL programs. “School reform is doomed to failure until it faces the reality of kids as they come: stressed-out, overwrought, and inattentive to school work. This marvelous book fills this gap with a curriculum that helps teenagers reduce stress, handle their emotions, and master their attention. A step-by-step guide for teachers and clinicians, Learning to Breathe is clear, inventive, and practical, and it can be implemented starting tomorrow. 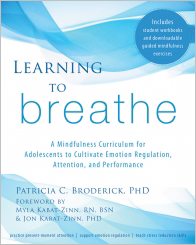 This inspiring book is also a timely wake-up call for the nation.” Jerome Murphy, PH.D.
“Learning to Breathe offers a time-tested, research-based solution to assist young people in cultivating positive qualities, such as mindful awareness and compassion for oneself and others. [The book will] inspire young people to use these qualities in the service of the greater good in the twenty-first century. I hope we see this curriculum in all of our schools.” Robert W. Roeser, Ph.D.
“Even when we have an inside familiarity with the practice of mindfulness it is challenging to make it accessible and meaningful to others. Broderick’s book and program have done just this-translated the practice into a practical, accessible program for both teachers and students. 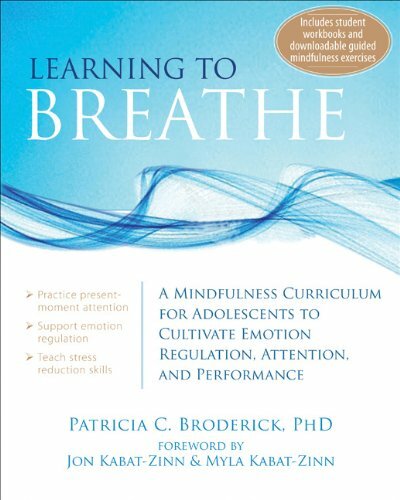 The result is a curriculum that maps beautifully onto both the opportunity and the vulnerability that are inherent in the teenage years.” Rebecca Crane, Ph.D.
Learning to BREATHE (L2B) is a sequenced mindfulness program that can be used to introduce adolescents to mindfulness and its practice. L2B is appropriate for many settings (e.g. schools, universities, clinical settings, after-school programs, residential facilities, etc.). 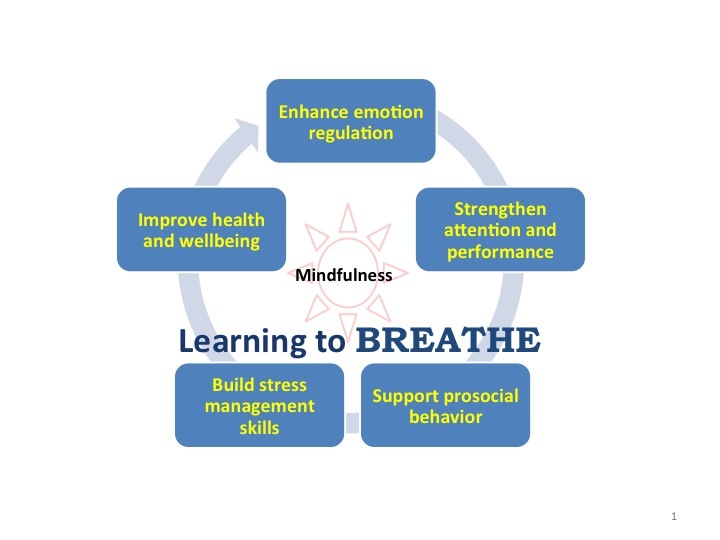 CASEL includes Learning to BREATHE as 1 out of only 4 programs in the mindfulness category that meets their standards for evidence-based programs. More detail about all the publications, including full text copies, is available by clicking the Short Research Summaries link. Another link, “What consumers should know about choosing a mindfulness program“ explains the importance of research in program selection for schools, clinical practices or other institutions and workplaces. L2B’s Facebook Page is the place for most current updates about L2B. The complete Learning to BREATHE curriculum, including 6 and 18 session versions and free, downloadable supplementary materials, is available from New Harbinger Publications and Amazon. Individual student workbooks for the 6-session version are also available separately. The complete program is also available in Chinese from Big Apple Publishers.